Part One of this mini-series discussed the ageing of our prison population, and the implications of this over the coming years. Part Two explores the interesting, but little-discussed, recent trend of increased sentencing of older people, coupled with the reverse trend for younger age groups. The changing age profile of the criminal justice system is not only seen within the existing prison population, but also when looking at sentencing rates. It is rarely acknowledged that criminal activity can also be committed by older people; they are almost universally portrayed as ‘victims’ of crime. Whilst older people are most certainly a vulnerable group and are often the targets of crime such as fraud, it does a disservice to the whole population to fail to recognise that people might be committing crimes at increasingly old ages. 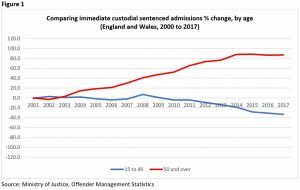 As shown in Figure 1, between 2000 and 2015, we see an 87% increase in immediate custodial sentenced admissions to prison (defined as a count of prisoners sentenced by a court) among those aged 50+, compared with a 34% fall for those aged 49 and younger.In other words, we are not simply talking about an ageing existing prison population, but also an increasing number of older people going through the criminal justice system and being convicted of a crime. In 2017 there were over 6,100 older people (aged 50+) admitted to prison, compared to just over 3,200 in 2000, and this needs to be recognised and acted upon. This dynamic, however, is not reflected in crime prevention programmes. Although there is certainly an important argument to make for targeting such activity at children and young people (these programmes frequently have positive outcomes and help in crime prevention), there is a dearth of activity around preventing crime at older ages, be that for first-time offences or criminal activity by frequent offenders. Whilst the overall number of crimes committed by those aged over 50 is lower than for the rest of the population, the number is growing rapidly, not only outright but also as a proportion of overall crime. Acknowledging that an increasing number of people aged 50+ are going through the courts, there are many important factors to bear in mind. Firstly, there is the potential for ageism and discrimination by the jury and/or by the judge (be that positively or negatively directed). The recent increased age limit for jurors from 70 to 75 is a valuable step in ensuring that older people maintain their right to be tried by a jury of their peers, as well as ensuring that older people can remain active participants in their community. It is necessary to consider appropriate bail and remand procedures for older individuals charged with a crime, in particular bearing in mind specific health factors including mental health. Guidance would be welcomed to cater to this cohort’s requirements, whilst also balancing the complex factors enshrined in the Criminal Justice Act (2003) such as punishment, public safety, rehabilitation, reducing crime rates and reparation for victims. Sentencing decisions must also demonstrate flexibility and nuance, considering the complex weighting of factors including crime severity, public safety, and also demands on the public purse, noting the considerable health and social care implications associated with imprisoning older adults. The Ministry of Justice should make data available on first offences and the types of crime being committed at older ages, to help further monitor and act upon emerging trends. Part Three of this mini-series will look at life after prison, including rehabilitation and reoffending rates. The post will explore current trends and discuss how society can better support older offenders to reintegrate into their communities.